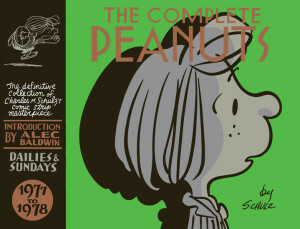 Charles M. Schulz steers his all-conquering newspaper strip into the mid-Seventies in volume thirteen of The Complete Peanuts. Here Schulz introduces three of Snoopy’s relations: his wandering brother Spike from the desolate Needles, his sister Belle from Kansas City and an unnamed nephew. They all look like comedy funhouse mirror versions of the original model, of course; fatter, thinner, taller, moustached or with long eyelashes. 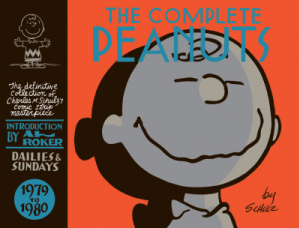 With the fantasy elements of Snoopy’s personal life beginning to dominate the rest of the strip, these years are where fans’ opinions on Peanuts begin to diverge. 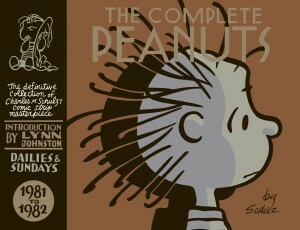 For the first group, the unique balance of characters and situations in Peanuts is wrecked when Snoopy becomes just one of many cartoon dogs rather than a single, strange and funny character who is more than animal but not human either. 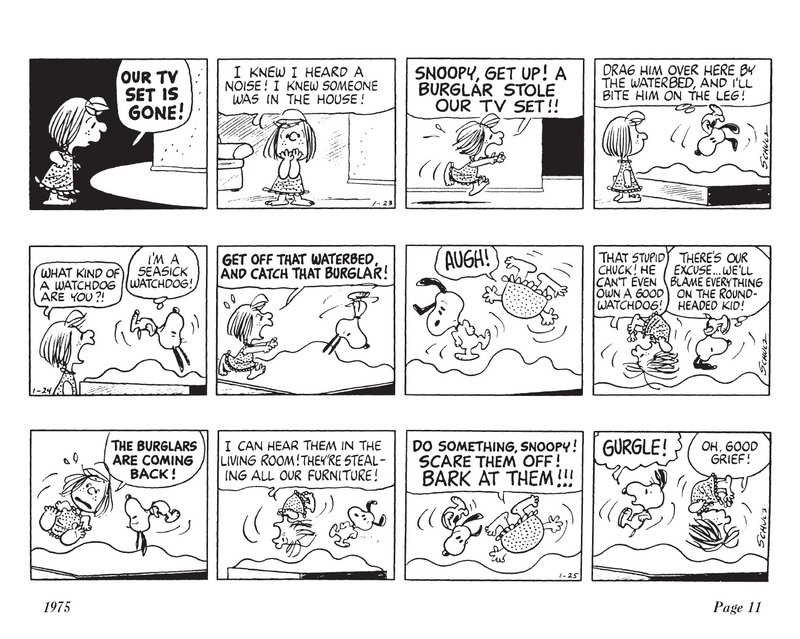 For the second group, the more Snoopy the better, and his siblings make everything that much funnier with their variations on Snoopy’s surreal existence. 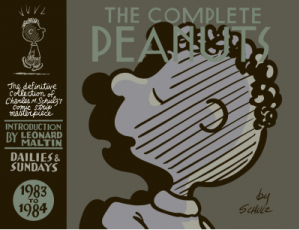 There’s no resolving these two opposing positions and your enjoyment of the changed tone of Peanuts in the next few volumes, with much sillier stories for everyone, will depend upon which side of the divide you come down. 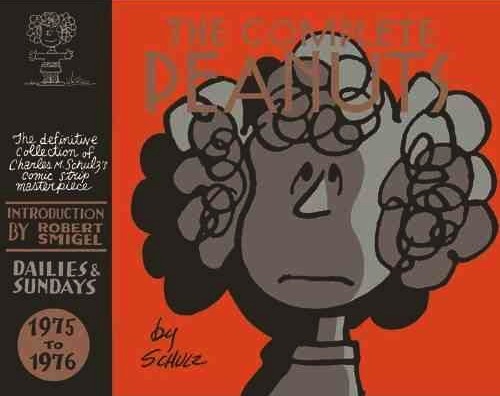 Stories in this volume include Snoopy and Linus meeting a girl called Truffles and finding themselves competing for her affections: “You never loved Truffles the way I did! I loved her as a person! You only went to see her because she gave you cookies!” Charlie Brown’s baseball career continues to be disastrous but he finally meets his idol Joe Shlabotnik. The talking school building has a violent nervous breakdown, so Sally and Charlie Brown have to go across town to attend school. Charlie Brown has to share a desk with Peppermint Patty: “Your hip is touching my hip, Chuck!” Marcie meets a boy called Floyd at camp but she’s just not ready to be called ‘Lambcake’. Peppermint Patty enrolls at a private school recommended by Snoopy, and the name of the cat next door is finally revealed. Frieda with her ‘naturally curly hair’ is the cover star of this volume, but as regular readers will have realised by now, the featured cover spot is assigned pretty randomly and she doesn’t have any larger storylines in this collection, just her usual short appearances. The introduction is by Saturday Night Live comedian Robert Smigel.